To use: fill reusable muslin bag with bath tea, & let steep in a warm bath for 4-6 minutes. relax, and enjoy! 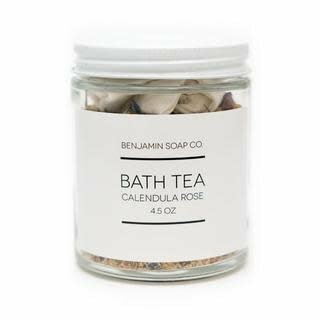 Ingredients: organic rose petals, calendula & cornflower petals, lavender buds, pacific sea salt, & pink Himalayan salts. Each 6 oz jar includes a reusable muslin bag so you can enjoy your bath tea for up to 5 baths. 5oz. Handmade Crystal Soap. Quartz sphere, clary sage and mica.